Hello everyone! Welcome to Day 2 of the Pretty Pink Posh Product Release Blog Hop. If you are new to my blog, nice meeting you! Hope you feel comfortable here :). Don't forget to leave a comment for a chance to win a $25 gift certificate! ¡Hola a todos! 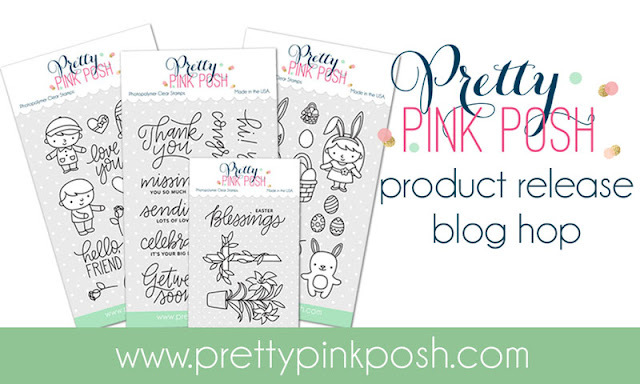 Bienvenidos al "Blog hop" de lanzamiento de la colección de marzo de Pretty Pink Posh. Si eres nuev@ en mi blog ¡encantada de conocerte! Espero que te sientas a gusto por aquí :). ¡No os olvidéis de dejar un comentario para participar en el sorteo de cuatro tarjetas regalo de 25$! 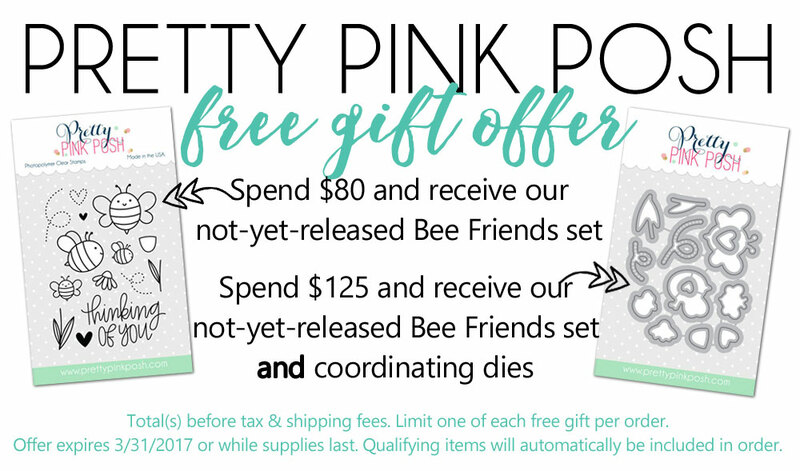 I have a shaker card to share with you today using "Easter Friends" and the not-yet-released "Bee friends" stamp set (you can get this one for free with orders over $80!). I also used the new "Stitched notes dies" to create the frame and filled the inside of the card with "Aquamarine" sequins, the new "Sparkling Clear Confetti Mix" and lots of flowers I previously colored and die cut. Mi tarjeta de hoy es una "shaker card" que he hecho con los sellos "Easter Friends" y "Bee friends" (este último todavía no está a la venta pero puedes conseguirlo gratis con compras superiores a 80$). También he usado los nuevos troqueles "Stitched notes dies" para hacer el marco y he llenado el interior de la tarjeta con un montón de flores que había coloreado y troquelado previamente y lentejuelas color "Aquamarine" y "Sparkling Clear Confetti Mix". To make the sky I created my own "cloud stencil" and inked around the edges using a Stencil Brush and dye inks. I also have a video tutorial where you can watch how I did it! Just press play below or go to my Youtube channel! Para hacer el cielo he creado mi propia plantilla de nubes y he coloreado alrededor del borde con un pincel de estarcido y tintas azules. Si queréis saber más detalles de cómo lo he hecho podéis ver el tutorial aquí abajo o en mi canal de Youtube. Remember that there are four (4) $25 Gift Certificates up for grabs. There will be two winners for each day of the hop and you have until 11:59 PM PST on 3.17.17 to leave comments to be entered to win! Winners will be announced on the Pretty Pink Posh blog. Recordad que hay cuatro (4) Tarjetas regalo de 25$ para repartir. Habrá dos ganadores cada día y tenéis hasta las 11:59 PST del día 17.3.17 para dejar comentarios en cualquiera de los blogs que participan. Los ganadores se anunciarán en el blog de Pretty Pink Posh. 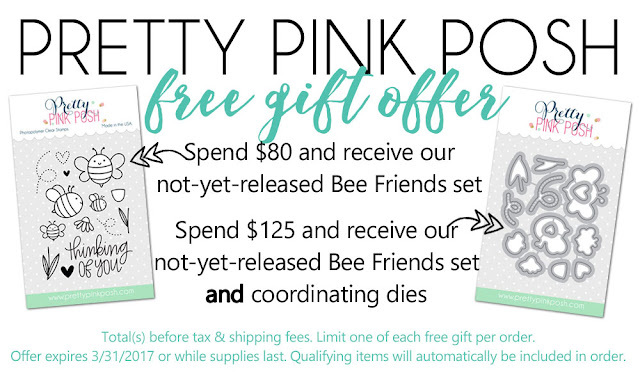 Also, there is a free gift with orders over $80, while supplies last! Además, hay un regalo con pedidos de más de 80$ hasta agotar existencias. Thank you so much for stopping by, your next stop is the amazing Joni Andaya! Below you have the full list of blogs for today's hop and also the supply list. Have a great day! ¡Muchísimas gracias por la visita! ¡La próxima parada es la increíble Joni Andaya! Debajo tenéis una lista completa de los blogs del hop de hoy y la lista de materiales. ¡Feliz fin de semana! I love the fun clouds and adorable bunnies! Totally cute & fun! Awesome job! I love the little flowers in the shaker. So cute. I love your card! Great idea for the cloudy sky too. These new sets are gorgeous! So cute! I really like shaker cards! Shakers are my favorite and this is so adorable! Preciosa, que ideas más buenas tienes!!! Cute card. Love your shaker card ideas. Lovely shaker card! So bright and fun! Thank you for sharing it. I love this card! I really like how you placed the bunny and bunny person. They look like they are peeking into the frame. Shaker cards are my favorite! You are very talented and creative. Great shaker card! So cute! WOW! I am just getting in to card making. I think it will take me a while to be able to make a card like this. It is absolutely adorable! I absolutely LOVE this card/video!! Saved it for later so that I can give something like this a try very soon. So pretty! Love this shaker. Also love PPP...their colours and sparkle always make me happy! LOVE your darling card and this new release!! I have been watching this video over and over. You make it look so easy. Very inspiring. Love! I really like doing cards with critters or kids peeking up from the bottom or side like that. This is too cute! The sweet characters and bright colors make me happy :) The cloudy background is really pretty too! I just love shaker cards and yours is so adorable. That little kid in the bunny suit just makes me laugh! I love your card! I love the tricks you did with the press and seal and using the corner of the acetate like that. So adorable. Little Crafty Pill videos and cards are always my favorite! Great card and thanks for the chance to win. Your card is so cute and the PPP stamps are just adorable! So very super cute Amada, I looooove it! I just commented on your last post (the prismacolor) by accident. I love the little floating floral images in the shaker on this one--Thanks for TWO great inspirations! Loved your card... the clouds are perfect! So glad PPP is up and running again. This release is wonderful! Will make excellent Mother's Day cards! excellent! that is the coolest shaker card i've ever seen. well done. Me encanta la tarjeta, es muy cuqui, la verdad es que me gusta todo lo que haces y estoy deseando ver tus trabajos. Hola! Always enjoy your card making and tips! Such a darling shaker card, Amanda! Thanks again for the video! Wonderful shaker. Thanks for the video. One of my favorites of yours. So pretty. I really enjoyed your video, your card is adorable. Adorable shaker card! Love the sequins and flowers floating behind the bunnies. Bonita targeta, eres mi auténtica inspiración, me encantan tus vídeos y alguna que otra de tus ideas he puesto en práctica. Hecho de menos algún mini álbum, uno que colgaste ya hace tiempo era monísimo! Felicidades por tan bonitas ideas! Thanks for the giveaway. Your card is so cute. Love the clouds. Your card is adorable. Love PPP- their images are so well done. I really like the flowers floating around above the rabbits :) Thanks for sharing and for the chance to win! You spring shaker card is a delight. Thank you for the inspiration. I love the ideas that you used in creating this card! Thanks for sharing! The shaker bits with the little flowers are too cute! Such a sweet shaker card!! What a cute card...love it! Absolutely precious Amanda. I had to pin this one to try, its just too sweet! TFS! Very sweet shaker card! Enjoyed your video! So cute...love the clouds and the shaker elements! This is a delightful card. So many things to enjoy from the shaker elements to the lovely little flowers and cloud covered background. Thanks for sharing this. I love this card. The little flowers flying around is so cute. I love how you used the stamped flowers in the shaker, so clever! It's a beautiful shaker card and I just love the cloud background you created! :) TFS! Your card really makes me think Spring! Love the shaker element & pretty design! Love it - what a great new release. What a cute card, Love Pretty Pink Posh! Such a sweet Spring shaker card. What a fun card! Thank you for sharing your blending technique. It was something new to me. Loved how you used press and seal--brilliant!! Wonderful spring card. Love the little flowers in the shaker, how fun! OH my Gosh this card is darling. I love the shaker part and adding a few sequins adhered down. Great look. Great stamps and dies. love the release. Fabulous shaker card. I especially love that you cut out the flower tops and used them as shaker filling. Your colors are so perky! Such a sweet shaker card! Love those little flowers! I absolutely love your cards...I've been a fan for awhile. Love watching your videos too. your shaker card is super, super beautiful! What an adorable card. Thank you for sharing. That is a beautiful card. Your clouds are very original. Love your work. Your shaker card is oh so cute and super sweet!! What a darling card - I love it! Thanks so much for sharing and about your tips on the new brushes. I have the clarity brushes and was interested in your thoughts about them!! I like how you created the background for your cute and adorable shaker card. Love your design with the bunnies in the corner & the big blue sky behind them!! Fabulous inking! Also love how you have both the sequins & the flowers within the frame!! So cute. I love how the bunnies are peeking inside the frame. Thank you for sharing. Love the cloud background. Great card. I love your shaker card, they are my favorite type. gave it a lot of character. Thanks! Love this card!! Thanks for sharing the video! I like how you have the "bunnies" peeking out of the opening. I love this card! It's so cute! Love this Shaker Card. Love the simplicity of it. I can just about hear that card shaking here, cool shaker card. The falling flowers are fabulous! WOW! Your card is so darling. I love the cloudy sky background and all the elements you colored. It is a very cute shaker card. LOVE the Spring card!! The background is amazing! Hola. Gracias por una tarjeta tan hermosa. PPP is amazing! Thanks for a beautiful card. I love shaker cards! Love the background you created! Thanks for sharing! Great tutorial! Love the cloud background with these adorable stamps. Oh how sweet!!!! This is such a sweetie shaker card!! Love the little flowers dancing behind those adorable "bunnies"!!! Super creative and gorgeous sky! Loving it! such a fun card! Has me dreaming of spring! Love! Especially the cloud background. TFS! What an ADORABLE shaker card!! ADorable little scene...love the raining flowers. I LOVE your shaker! It's so pretty and I love the blue! Adorable! Beautiful background you've created for your sweet card! I love that you made it a shaker card! Love the pastel colors and the cloud background. Great release from PPP. Such a pretty card! Thanks for showing us how to make those pretty clouds! Hola Amanda, me encanta la for a simple y a la vez detallista de tus trabajos, el uso de los colores Prismacolor son una excelente version del uso de los marcadores copic. That is just too cute!! Love the blue sequins! Very cute card! Love the cloud background! You always make the cutest cards! love this one TFS! Todo lo que haces es elegante y delicado. Me encanta tu trabajo, muy inspirador siempre. Gracias por compartir tanto :). thanks for the video, so cute! Watercolor background / Hey chickie!